This is a question I’ve started to be asked a lot. As all of my MIY Collection sewing patterns (so far!) are designed for just this kind of fabric I decided it was high time I wrote a little guide to buying knitted fabrics. So, I’ll start with a list of places I’ve either personally used, been recommended or found online and been impressed with what’s on offer……. Ditto (www.dittofabrics.co.uk) – based in Brighton, designer quality dressmaking fabrics at great prices. Croft Mill (www.croftmill.co.uk) – regular new stock, great prices, good quality. Cloth House (www.clothhouse.com) – 2 branches on Berwick Street in Soho, jersey is in the one at the bottom end of the road near the market, furthest away from Oxford St. Sadly you can’t order from their website, but they do have a good mail order service; they’ll send you swatches and you can then order over the phone. MacCulloch & Wallis (www.macculloch-wallis.co.uk) – Dering St just off Oxford St, the company has been in the same lovely old building for over 100 years and has a vast range of fabrics and haberdashery, I’ve never been in and it not been busy! Minerva Crafts (www.minervacrafts.com) – a mind boggling selection of fabrics including some great knits. Organic Cotton (www.organiccotton.biz) – some beautiful quality organic cotton knits, including sweatshirt fabric at reasonable prices. Vend Fabrics (www.vendfabricsonline.co.uk) – good quality knits in basic colours including sweatshirt and rib. Ray-Stitch (www.raystitch.co.uk) – independent sewing shop in Islington with a lovely range of striped jerseys and the biggest range of bamboo jersey in plain colours that I’ve come across. Fabric Godmother (www.fabricgodmother.co.uk) – an extensive range of knitted fabrics at great prices and an easy to navigate online shop. 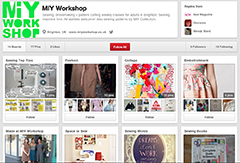 My Fabrics (www.myfabrics.co.uk) – online shop with a huge selection of fabrics including lots of knits. Funki Fabrics (www.funkifabrics.com) – what it says on the tin! 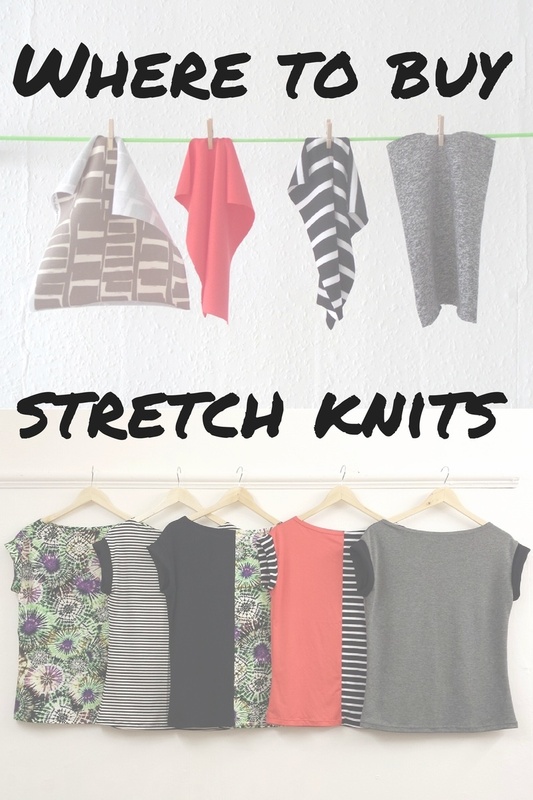 Stretch knits in every colour and print imaginable! Abakhan (www.abakhan.co.uk) – good range of jersey fabrics and extensive haberdashery and craft supplies. Calico Laine (www.calicolaine.co.uk) – good range of plain colours. Remnant House (www.remnanthouse.co.uk) – big range of printed jerseys. Stone Fabrics (www.stonefabrics.co.uk) – huge selection of jerseys including silk, bamboo, roma and wool mix, printed, striped and plain. JERSEY – a single knit fabric with knit stitches on the wrong side and purl stitches on the right side, it is the most common knitted fabric and is usually found in t-shirts, etc. It can be cotton, viscose, bamboo, polyester or silk and come with or without Lycra. INTERLOCK – a double knit fabric which looks same on the right and wrong sides, it’s thicker and smoother than jersey and is much warmer. It tends to be cotton. PONTE DI ROMA – sometimes called ponte roma or just ponti or ponte, or roma! So no chance of confusion there then!!! Ponte di roma means Roman Bridge, which describes the texture on the surface of the fabric. It’s another type of double knit interlock fabric which usually is quite thick and heavy and so can be used for more structured dresses and jackets. Is usually a synthetic fibre, often a mix of polyester and viscose and can also contain Lycra. CUT & SEW KNITS – these are fabrics with more of a “knitwear” look and so look more like a traditional piece of knitted fabric. It can be available felted, offering a nice thick warm, stable fabric and often has a high wool content. So, the types of knitted fabrics are described above. These fabrics can all be made using different fibres. Below are some of the most commonly used fibres in knitted fabrics, they can be used on their own or blended with other fibres. BAMBOO – good for sensitive skin, cool and with a good drape, tends to be found in jersey fabrics only. COTTON – not such good drape as bamboo and viscose, cool, absorbent, found most often in jersey and interlock fabrics. VISCOSE – made from wood pulp, has excellent drape, is very absorbent and very stiff and heavy when wet, it can take a long time to dry. Viscose jersey is a lovely drapey fabric and viscose is often found mixed with polyester or wool in other knitted fabrics. POLYESTER – a synthetic fibre which comes from oil, it’s strong, won’t shrink, isn’t breathable so can make you hot and is quick to dry as it’s not absorbent. Can be found in most knitted fabrics. WOOL – natural fibre from sheep, a good insulator so keeps you warm, needs gentle washing, can pill (bobble). Sometimes found in jersey fabric and in cut & sew knits. SILK – soft to the skin, lovely heavy hang and drape, needs gentle care, expensive. Silk jersey is a really lovely fabric! LYCRA – certain uses of knitted fabrics require the need for Lycra, for example leggings or very fitted garments where you don’t want parts of the garment to go baggy – who wants baggy knees in their leggings?! But what is Lycra? Lycra is a brand name for an elastic fibre called spandex or elastane. If you’re making leggings or need Lycra for something like a waistband look for a knitted fabric with a minimum 3% elastane or Lycra content. If you’re making sportswear or dance clothing you may need as high as 5% or 7%. All natural fibre fabrics will shrink when first washed. Either wash your fabric before cutting or hand wash or very gentle wash your finished garment. This entry was posted in MIY Collection Sewing Patterns, Sewing & dressmaking, Sewing help and tagged fabric shopping, miy collection, Wendy Ward, where to buy jersey fabric, where to buy knit fabric, where to buy stretch fabric. Bookmark the permalink.